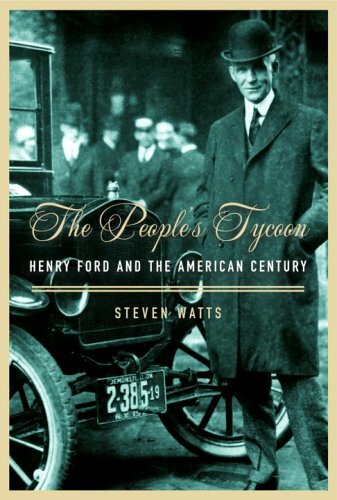 Product Description: Henry Ford, a major architect of modern America, has lived on in the imagination of his fellow citizens as an enduring figure of fascination, an inimitable individual, a controversial personality, and a social visionary from the moment his Model T brought the automobile to the masses and triggered the consumer revolution. But never before has his outsized genius been brought to life so vividly as by Steven Watts in this major new biography. Watts, the author of the much acclaimed The Magic Kingdom: Walt Disney and the American Way of Life, has produced a superbly researched study of a man who was a bundle of contradictions. Ford was the entrepreneur who first made the automobile affordable but who grew skeptical of consumerism’s corrosive impact on moral values, an employer who insisted on a living wage for his workers but stridently opposed unions, who established the assembly line but worried about its effect on the work ethic, who welcomed African Americans to his company in the age of Jim Crow but was a rabid anti-Semite. He was the private man who had a warm, loving marriage while siring a son with a mistress; a father who drove his heir, Edsel, so relentlessly that it contributed to his early death; a folksy social philosopher and at one time, perhaps, the most popular figure in America, who treated his workers so harshly that they turned against him; creator of the largest, most sophisticated factory in the world who preferred spending time in his elaborate re-creation of a nineteenth-century village; and the greatest businessman of his age who haplessly lost control of his own company in his declining years. Watts poignantly shows us how a Michigan farm boy from modest circumstances emerged as one of America’s richest men and one of its first mass-culture celebrities, one who became a folk hero to millions of ordinary citizens because of his support of high wages and material abundance for everyday workers and yet also excited the admiration of figures as diverse as Vladimir Lenin and Adolf Hitler, John D. Rockefeller and Woodrow Wilson. Disclosing the man behind the myth and situating his achievements and controversies firmly within the context of early twentieth-century America, Watts has given us a comprehensive, illuminating biography of an American icon.